Waterborne basecoat adoption will continue to grow, a PPG manager predicted, and the company wants to offer such low-VOC options for every coat in the automotive refinishing process. Ironically, the comments from Tim Jones, PPG’s automotive collision waterborne coating and refinish segment manager came Oct. 1, the same day the Environmental Protection Agency announced it would tighten the air quality standards for ground-level ozone. U.S. regions will have between 2020 and 2037 to hit the new standards, depending on their air quality. As in the past, this could include restrictions on products with volatile organic compounds — such as solvent-based paints. VOCs combine with nitrogen oxides to produce ozone, which is obviously a good thing in the stratosphere but harmful to human respiratory systems on the ground. The world also has moved further towards waterborne by regions like Europe and China refusing to exempt any solvents — except water — in refinishing overs (clearcoat) and unders (primers and sealers) when calculating VOC levels. Canada and the U.S. allow the exemptions, saying the substances in question don’t contribute to smog. Still, Jones predicted it would still be “several years” before the industry could shift fully to waterborne, and the holdout areas certainly wouldn’t switch to the global standards in the next three to five years. 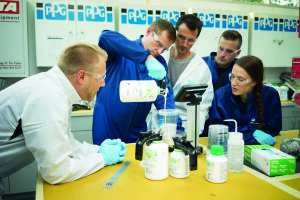 He noted that as a global company, PPG would focus on what type of standards were adopted by the most worldwide customers. Those wanting to learn more from PPG should check out “Paint Shop Performance” with John Fagan. The presentations will be at this year’s SEMA Show as part of the Society of Collision Repair Specialists’ Repairer Driven Education series. Register here. In fact, PPG has more waterborne customers in areas of the U.S. which haven’t met the EPA’s existing standards than those in the compliant regions, Jones said. It recently crossed the 10,000-customer mark for waterborne basecoats in the U.S. and Canada, though it’s nowhere near a 50-50 waterborne-solvent customer ratio. “That’s still sometime down the road,” Jones said. “It’s all because of color match,” Jones said. Waterborne basecoats have a single reducer: water. The paint reduces 20 percent, while solvent-based paints reduce 100 percent and won’t always end up with as good of a match. The difference becomes even clearer with paint containing mica and aluminum, the orientation of which can be affected by solvent and the environment. “You get less variability using a true waterborne system,” Jones said. When you pull a color chip and mix the paint properly, “that is the color that I end up with,” he said. There’s no need to do multiple spray checks and increase cycle time. Jones also said waterborne paint was superior when it comes to blending paint into adjacent panels. “The ease of blending is just outstanding,” he said. However, waterborne paint will usually take longer to dry, though in some climates it could be quicker, according to Jones. But drying won’t take longer than 20 minutes, which is the amount of time a single extra spray-card to color-match solvent-based paint would take, he said. The paint technician must have dry, clean air emerging from the airline — that’s a “critical factor.” If that’s not available, you’ll need some sort of drier or dessicant. The shop will also need a stainless-steel spray gun to ward off corrosion, he said. Jones recognized that changing paint systems was “one of the hardest things a shop can do” because of its employees history and comfort level with an old standard. But change is inevitable, he said. Waterborne paint became particularly a hot topic in collision repair when California in 2007 adopted more stringent requirements than the U.S. The California Air Resources Board has 19 districts, most of which set the basecoat VOC limit at 3.5 pounds per gallon compared to about 5-5.2 pounds nationally. Californiaesque standards have been adopted in Maryland, Delaware and all Canadian provinces, according to Jones, and he said Phoenix’s Maricopa County is close to making such a move. Other states are working together on VOC standards, such as the Ozone Transport Commission of East Coast states in different stages of adopting VOC levels. There’s also LADCO (Lake Michigan Air Directors Consortium) serving Minnesota, Ohio, Michigan, Indiana, Illinois and Wisconsin, and those states too vary on developing individual rules.